Even though we expected the roadster version of Mercedes' SLS AMG supercar to be revealed at the recent New York auto show, the German automaker took the decision to perform the world premiere of its flagship drop top model at the upcoming Frankfurt motor show this September. Along with the announcement Mercedes also released the most revealing photos of the new SLS AMG Roadster so far, though the vehicle is not 100 percent exposed due to some discreet black adhesive foil covering parts of the headlights, taillights and the central parts of the grille and boot lid. 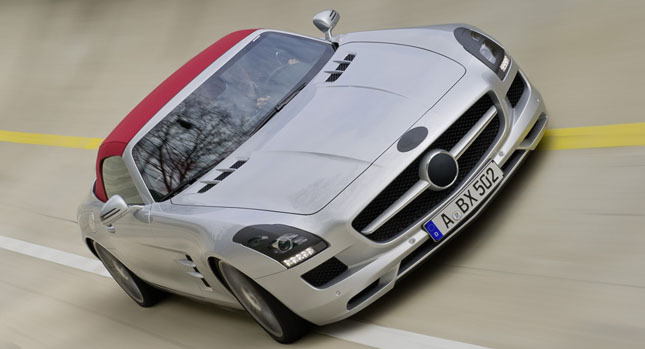 As expected, the SLS AMG Roadster looks very similar to the coupe, with two notable exceptions: the soft-top roof and, as a consequence, the use of conventional- instead of gull wing- doors.